While artificial grass requires far less maintenance than regular grass, there are a few things you should do to keep it looking great for many years to come. 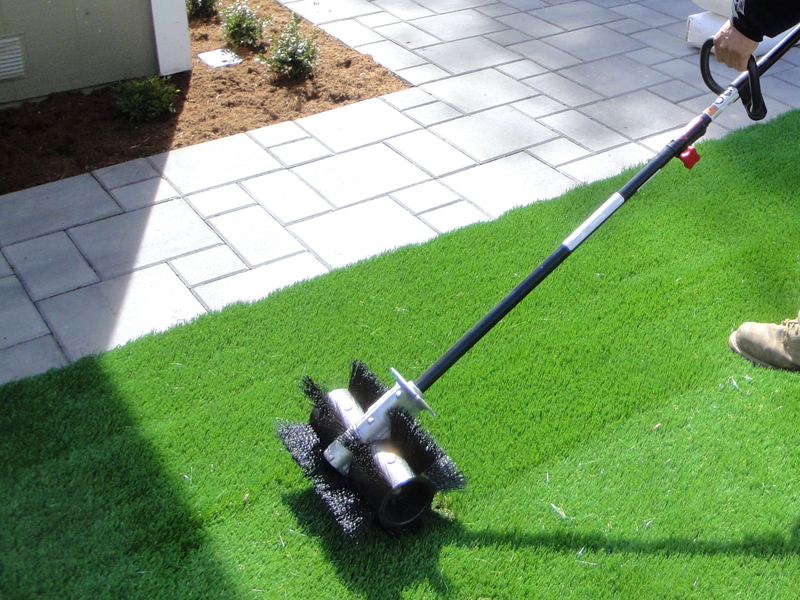 Our company, the best artificial grass and synthetic turf lawn care service maintenance company in San Diego. Whether it’s an artificial pet turf area, golf putting green or synthetic playground grass, we will provide you with the best methods to maintain your turf. By following the guidelines below, your synthetic turf will stay looking top-notch throughout the year. Natural rainfall typically cleans turf just fine. However, if there’s little rain in your area, then a quick clean with a hose will get the job done. If you need to clean a part of your synthetic turf, then just mix 5% household detergent with hot water, scrub it into the soiled area, and then rinse. A simple technique that’s a real life-saver! For more serious spillages, follow the above steps, before also applying a mixture of 3% ammonia and hot water, in the same process as above. Then, just rinse with warm water, and you should find those stains disappear. Stains are far easier to remove when they are fresh than when they are dried in. Often, substances can be quickly and easily removed with a tool such as a spatula, and any excess can be cleaned up with a kitchen towel. Our artificial grass material fibers are made to be stain resistant, but you should be careful not to use cleaning products that could penetrate and damage other parts of the turf, no matter if it’s a playground turf, golf putting green turf or any other synthetic turf project. We’ve listed cleaning solutions in two levels below, based on the danger that they pose to the turf. You can use as much of the first group as you like, but should only use a light amount of the second group, to keep the turf in top condition. Our artificial grass is pet friendly, as proven by our pet turf installation service. You can take these additional steps to keep any waste odors to a minimum. Allow for solid waste to dry then pick up to dispose. If there is not much rain in the area where you live, you can hose down the area to drain the urine and keep the surface clean and unsoiled. If you have more than two pets, using enzyme neutralizers can safely and effectively limit and control pet odors. A homemade mixture with white distilled vinegar, and the same amount of water can be applied after hosing down the turf with clean water. Dry ice, aerosol pack of refrigerant offered by many carpet cleaning suppliers can remove chewing gum and tree sap. After freezing it, scrape the substance carefully with a kitchen knife. Hydrogen peroxide in water can be used in the area with a sponge. When done, wash with clean water. Depending on how much traffic you get on your turf is determined on how much you should regularity brush your artificial grass. Matting can occur when there is high foot traffic, even more likely when the turf contains pollutants, or has been soiled with dirt. Regular cross brushing of synthetic turf can help recover the look of the turf. “Cross brushing” is when you brush against the nap, grain, or sweep the turf. When the fiber are brushed, the fibers become fluffed. Make sure to always brush with synthetic bristles, never use harsh brushes such as wire bristles, or metal, because it will damage the turf. It is important to brush the area with the most heavy traffic, as the areas will look different from the spaces that don’t. When you regularly brush you will extend the life of your turf and will require less maintenance. Don’t leave any vehicles idling on the synthetic turf. Don’t place furniture with sharp edges on the turf, or they may tear it open. Keep cigarettes and other open flames well away from synthetic turf. Avoid reflecting direct sunlight onto the turf, or it may ignite. Remove sprinkler heads from the lawn before placing the turf, or they may cause discoloration. By properly caring for your synthetic turf, it will stay looking lush and green for many years to come, giving a great return on your investment. To get your free artificial grass estimate today, or if you have any questions about our great service, contact the professionals at the best artificial grass lawn care maintenance service in San Diego today!